The canticles that usually emanate from these shores are not usually appealing. The irritating nature of many Nigerian stories is not dependent on the acoustics, but rather on the apparent failure of things around us. In this situation, we paint and see only depressing hues while many untold stories of extraordinary heroic acts go unsung. Hildegard Maria Ebigbo’s over three decades of love for Nigerian kids with special needs is one of such, but it almost went unnoticed. Mrs. Hildegard Maria Ebigbo hails from Fremdingen, Bavaria, in the Federal Republic of Germany. She was born on 13th August, 1950, into the solid and devout Catholic Bavarian family of Mr. Leonard and Mrs. Theresia Raab. She is the third of five children. She is a mother of four very successful children: three sons are doctorate holders in Biology, Medicine and Engineering. Her only daughter, who graduated with 1st class honours in psychology at the University of Nigeria, is a well known singer. She is also a traditional title holder – Ugoeze. Hildegard Ebigbo has been in Nigeria since 1977 standing by her husband Professor Peter Ebigbo (a Professor of Clinical Psychology, College of Medicine, University of Nigeria, Enugu Campus and by extension, the Nigerian nation, through thick and thin. Yet, she is in all respects, a true German. Starting as a Kindergarten teacher, Hildegard also worked for five years in different institutions in Germany with children with different disabilities, and had an in-service training as a speech therapist. This long diverse experience with children with special needs earned her a place at the Academy for Therapeutic Pedagogy in Wuerzburg, Germany, in 1975. That same year, she got married to Peter Ebigbo. 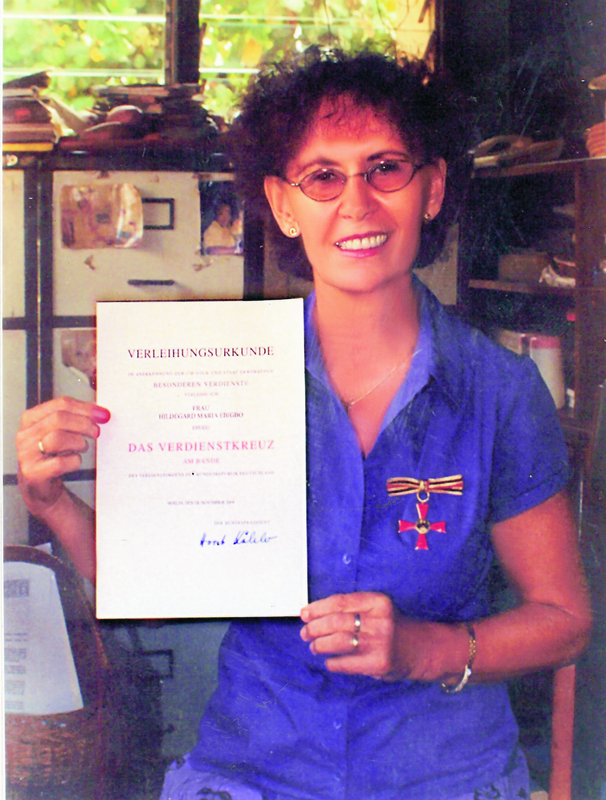 In 1977, she graduated with the overall best result, qualifying as a Therapeutic Pedagogist (Heilpaedagogin). Besides, no two special kids are the same; in other words the care for each one varies. Although this can be quite challenging for the parents, bearing in mind that most times, “special needs are commonly defined by what a child can’t do – by milestones unmet, foods banned, activities avoided, experiences denied. These minuses hit families hard, and may make special needs seem like a tragic designation,” asserts Terri Mauro. Nonetheless, Frau Ebigbo, as a therapeutic pedagogist, is a firm believer in the old wisdom of ‘strength in disability.’ For the past thirty years she had worked silently to change the prevailing attitude of parents of special kids, who most often only mourn their child’s lost potential. She has rather helped them discover that their child’s challenges make triumphs sweeter, and that weaknesses are often accompanied by amazing valour. Unfortunately in our climes, special children are often abandoned. With the griping economic situation, most parents cannot afford the fees that their extraordinary education entails. To her credit, Mrs Ebigbo has awarded countless scholarships to many indigent pupils. Her pride lies in seeing these kids graduating from her school into secondary and tertiary institutions. Some have been empowered and established in different trades and some others working in government establishments. These are people who would otherwise have turned destitute. 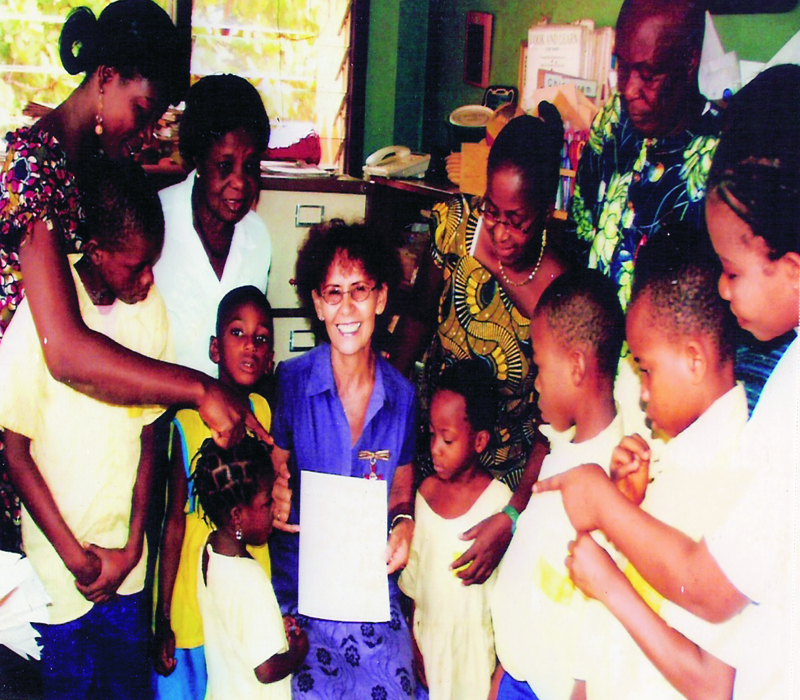 Hildegard Ebigbo became the guardian angel for most children with this condition through her school, Therapeutic Day Care Centre (TDCC), Abakpa Nike, Enugu. The TDCC was established in January, 1979, in the garage of their (Hildegard and Peter Ebigbo’s) university rented house. At that time (and to some extent, even now), there was great prejudice and a great tendency to neglect, or even kill, retarded children. It is interesting that Hildegard Ebigbo’s personal effort was not couched in slogans or ambitious delusions that seem to characterise the Nigerian story. Rather, her passion for these challenged kids was equally matched with a professional bias. Hildegard intervened with her concept of fruehfoederung or early furtherance, a project that turned out to be very successful and unique. It was discovered that early stimulation of the brain could still bring out great potentials in these children. TDCC currently has a special nursery and primary school, a sheltered workshop in Enugu, and an integrative school at Ihiala, Anambra State. At the moment there are 700 children at the TDCC Enugu and almost 400 at Ihiala respectively. She was able to shred the curtain of stigmatisation by nurturing both the challenged kids in her care and their families. She achieved this by creating an enabling environment (disabled friendly), where non-disabled and disabled children could have equal opportunities to do things together. Mr. Umego and Mr. Igbokwe assert that, “this is not easily found in any institution in Nigeria, and it is no exaggeration.” One could not but concur with them. For an individual to single-handedly achieve the UN’s policy of inclusive education for persons with disabilities, she certainly deserved the German President’s Merit Award. The impact of Ebigbo’s work with handicapped children was felt across the Atlantic. 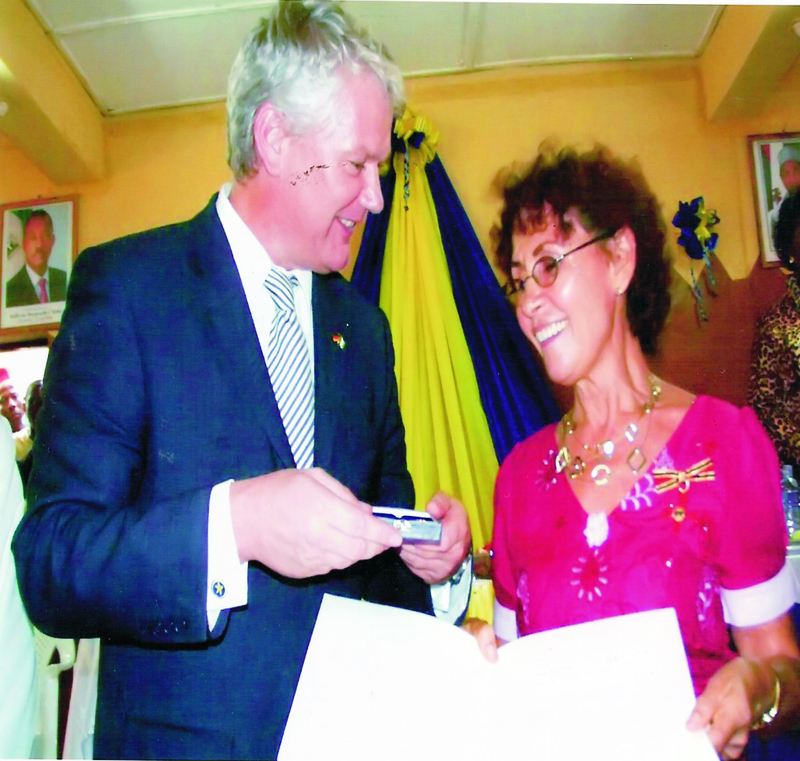 She was recently conferred with a National Honour of Bundesverdienstkreuz (Federal Order of Merit) by the German Ambassador to Nigeria, Herr Joachim Schmillen, on behalf of the President of the Federal Republic of Germany. This is certainly an honour well deserved and an acknowledgment of the ardour of a woman who believes in Nigeria. However, it is sad that Mrs Ebigbo was appreciated only by her home government. Though she is German but her selfless work had been in Nigeria and the recipients of her magnanimity are Nigerian kids. Truth be told, it is only logical that our government recognises her effort. Mrs. Hildegard Maria Ebigbo deserves more than a German Federal Order of Merit. With her work, she certainly merits a national honour from Nigeria. good morning. please, id very much like to know if this school is in existence and how to get in contact with them. How can I contact TDCC Enugu?